May 2 is the provisional date for the Las Vegas bout, but we’re not holding our breath for these guys any more. A DEAL IS on the table for a fight between Floyd Mayweather Junior and Manny Pacquiao on May 2 in Las Vegas, Pacquiao’s promoter Bob Arum told Yahoo Sports yesterday. 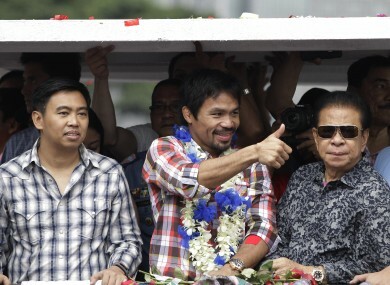 Arum says Pacquiao has agreed to the deal, as have Mayweather’s “representatives.” The way Arum frames it, all that’s left is for Mayweather himself to agree to the deal. Iole reports that Pacquiao has agreed to a 60-40 revenue split in which Mayweather would make an estimated $120 (€102) million and Pacquiao $80 (€68) million. After Arum showed that his camp would be agreeable to the lesser split, Sam Watson – who is apparently close to Mayweather advisor Al Haymen – said that The Money Team were ‘putting it together’. “They’re going to do a Showtime-HBO [joint pay-per-view] like they did last time with Lennox Lewis and Mike Tyson. Three or four years ago, this was the fight the whole world wanted to see. Now though, with Mayweather 37 and Pacquiao 36, the gloss seems to have faded. Email “Pacquiao and Mayweather camps say they're close to agreeing a $200 million deal to FINALLY get it on”. Feedback on “Pacquiao and Mayweather camps say they're close to agreeing a $200 million deal to FINALLY get it on”.